A Cryptokitties and Liquid sponsored publication has determined that Changpeng Zhao, Brian Armstrong and Vitalik Buterin are the most influential persons in the crypto world in that order. Well, this is absurd and while we cannot critic their finding, it beats logic that founders of centralized exchanges—and not developers—have been robed. Vitalik is influential and young. For his amazing work at Ethereum, he deserves a better position and so is Da Hongfei, the smart economy agitator and co-founder of NEO platform. All the same, this ranking won’t affect development in anyway. Months after releasing O3 Alliance SDK allowing for dApps to link with wallets without storing private keys, the team has fine-tuned the original version, rolling out an improvement, NEO DAPI v2. The new edition is better, secure and with more pros than cons unlike the previous release. To address some of the pertinent issues, the team worked on further simplifying user experience by standardizing information flow besides allowing dApps to accept NEO signatures as verification and authentication mechanisms. For security, the wallet from the new 03 NEO DAPI v2 will not only generate transaction and signatures but broadcast transaction to the network. All this is done in a user-friendly interface where the developer receives request from the wallet to perform some function via the dAPI. With a market cap of $489 million, NEO is trading within tight ranges. Nevertheless, we expect this consolidation to be a foundation for the next wave of bulls that will take prices above $15 and even $50 in the near-time. And we have anchors for this optimistic projection. First, NEO prices are down 95 plus percent from 2017 all time high and such a plunge is often always accompanied by an inevitable correction. Now as NEO hover around ATLs, it is likely that the short-term trend has been set and although prices are consolidating within a $3 range with floors at Dec 28 lows, a break above $10 would confirm gains of early Jan triggering aggressive buyers aiming at $10. For this reason, we suggest patience until price action is reinvigorated and prices edge past $10 resistance. After that, stops will be at $8.5 with first targets at $15. Meanwhile, IOTA is technically bullish. 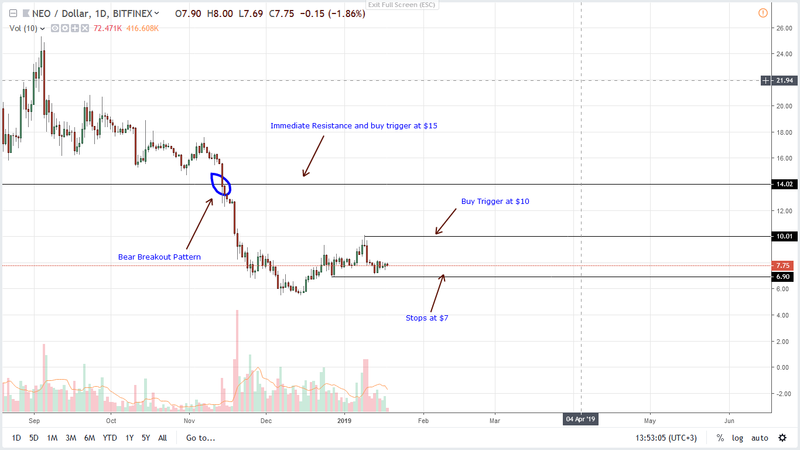 From our previous IOTA price analysis, we expect prices to rally towards 40 cents and 50 cents in a bull breakout pattern. 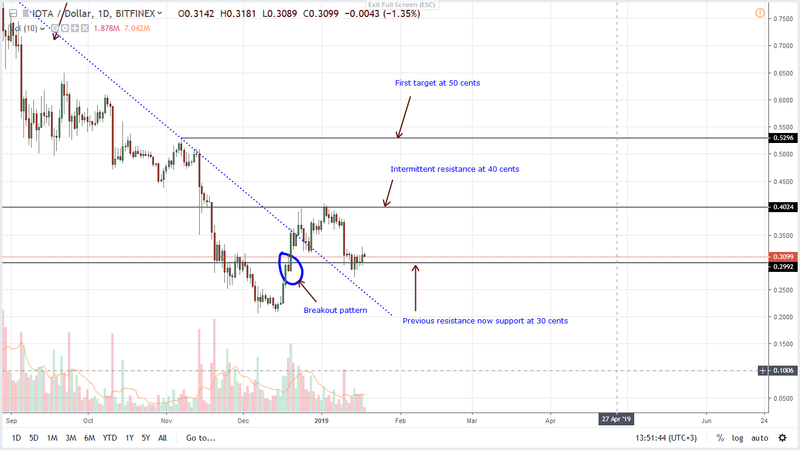 Notice that IOTA bulls broke above two levels of resistance—the 4-month resistance level on Dec 22—and above the 30 cents on Dec 22. It is for this reason that every dip in lower time frame should be another buying opportunity with first target at 40 cents.